Hi everyone, I was wondering if anyone owned/ knew of any good fantasy swords. I just love those tolkien inspired swords. Ecspeically those leaf blades. I cant get enough of those things. My very first sword was the fantasy kit rae "sword of Vaelen" it was a horrable version with a tiny rat-tail tang and a brass spray painted steel hilt and plastic grip that was chipped. So, if anyone knows any good FUNTIONAL fantasy swords i would love to hear about them. Check out Christian Fletcher's site: http://www.christianfletcher.com/. Angus Trim & Christian produce swords based on the LOTR, in fact I have 3 of them. 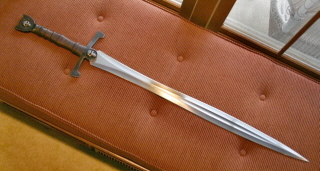 Also, John Lundemo at http://odinblades.com/ makes some impressive fantasy leafblade swords. Thanks guys I really love those jody samson swords! the special edition spatha is a dream come true. Rick Barret's "Muse" is very impressive also, a good cutter i bet! Anyone own a Leaf blade, Celtic, Roman, Fantasy? I would love to hear how they perform, I hear the shape makes really nice cuts. I own a fantasy leafblade by John Lundemo. 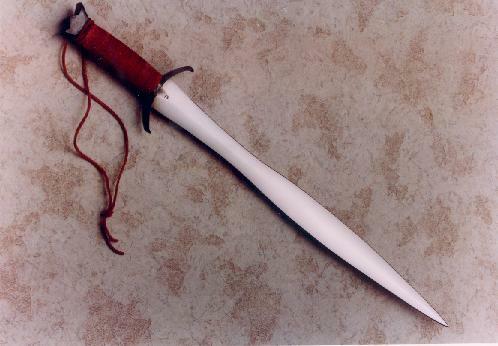 Great sword, 36 inch blade, about 48-49 inch total length. About 3,5 lbs in weight. I don't have a proper scale to weigh swords, sadly. It's the only fantasy sword in my collection, and I can't see myself ever ordering another fantasy sword again, I prefer historical replica's, and hopefully one day antiques, although I can't afford those now. But I'll admit, I really wanted a fantasy leafblade. Wow thank guys! great stuff. Lee, I love that sword you got from castle keep. It almost looks like the Christian Fletcher ranger with a leaf blade, really cool . Castle keep's pattern welding is amazing! I also love the Odinbaldes swords especially the glamdring and celtic swords. Anyone here own a jody samson sword? I love his leaf bladed swords; very nice detailing. I've bought a few items from this site and thier items are not very high quality (expect some katanas). What do you think about this sword? 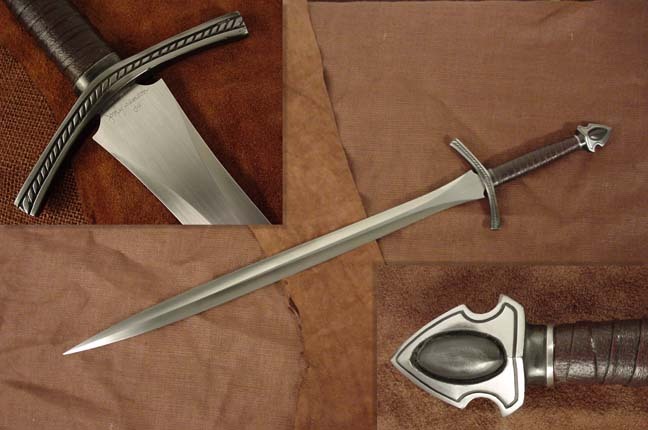 You might want to check out the "Hafling Sword" at By the Sword. It's a carbon steel, full-tang version of Frodo's Sting sword. As far as quality: probably about like a Windlass/MRL piece. Not on the Atrim or Albion level, but several orders of magnitude better than the "knife-shop-in-the-mall" 420 stainless trash. Certainly good enough for soft taget cutting purposes. A nice, inexpensive, fun sword is the Paul Chen/Hanwei Dark Sentinel. Bought one for my son last year for his 13th b-day and we've had a blast with it. When we have cutting practice/ get togethers, it usually gets a real work-out. Slays milk-jugs and pumpkins like no tomorrow. With the extra long grip it's easy to control (one of the reasons I got it for my son). There have been some who look down upon it, but like I said it's been great fun to have. I can also highly recommend Jody Samson's work. During our first visit to Albion Nathan Robinson and I handled every JS sword then on the premesis, and there were quite a few. With very rare exception almost every one I handled exhibited good handling characteristics. While many of them were a bit heavier than is now thought desirable, Jody's use of hollow grinding resulted in swords that have very nice dynamic handling qualities. John Lundemo is another smith who is worthy of consideration. I haven't handled any examples of his work, but he does come highly recommended by quite a few collectors. Thanks everyone! the jody samson swords have to be my favorite fantasy swords. His swords just make me say "how did he do that?". John lundemo's swords are very nice also, I love the fantasy cutting swords like the Ringare and predator. I also flip out when ever I see a sword with a leaf blade, hand and a half, with a scent stopper or claw with ball pommel. how do they make those things! pure genius. Al massey makes really nice pattern-welded blades also, those are so cool. . 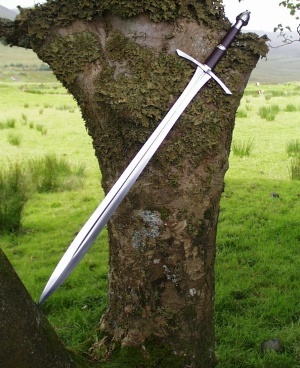 The Christian Fletcher swords are also very nice. The first time i saw his "maeglas" sword i just about keeled over. here's my favorite fantasy sword so far. (as seen in the gallery of jodysamson.com). I'm a very big fan of Rick Barrett's contemporary work. I've handled a lot of swords he's made, and they never fall short of being immensely impressive. He is on the higher end of the cost curve, but I think you easily get your money's worth. You have to see his swords in person to see the level of detail he goes to with his work. I have to second this also. I've been very impressed by everything I've seen from Rick. I don't know why I forgot about him. Rick is a craftsman of the first order.